Giving Canadians red finger tips and weird smelling breath since the 1970s , Ketchup Chips is the classic combination of adding ketchup-flavoured seasoning to potato chips. Every chip was dusted with tomato powder, garlic, onion and spices, infusing smoky, salty and sweet flavours. 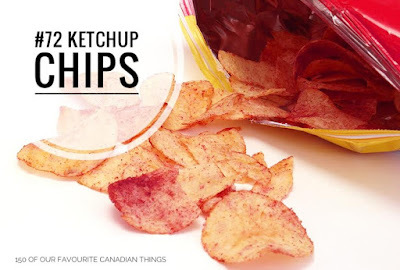 Since then, millions of chip bags have been ripped open and chowed down by Canadians, who have a hankering for the tart and crunchy addictive ketchup like flavour. Although it is a true Canadian snack, the origins of ketchup chips are entangled in mystery, with no one putting their hand up to take the credit. The easiest way to tell the story is like this, it’s believed that this red-powdered snack was first formulated by Hostess Potato Chips in the early 1970s, and retailed exclusively to the Canadian market. Canadians loved the flavour and it has been on the shelves ever since.